David Wells, Don Newcombe, Clyde Wright, Kenny Lofton, Ken Landreaux and Eric Davis. Walt Disney Studios announces the world premiere of “Million Dollar Arm” on Tuesday, May 6 at the El Capitan Theatre in Hollywood. Stars from the film will attend, including Jon Hamm, Aasif Mandvi, Bill Paxton, Alan Arkin, Suraj Sharma, Madhur Mittal, Lake Bell, Pitobash and Bar Paly, as will Director Craig Gillespie, Producers Mark Ciardi, Gordon Gray and Joe Roth and Executive Producers Palak Patel, Kevin Halloran, Bill Simmons and Connor Schell. Also scheduled to attend and walk the “green carpet” are acclaimed athletes Barry Sanders, Dave Winfield, Steve Garvey, Rollie Fingers, David Wells, Don Newcombe, Clyde Wright, Barry Sanders, Ken Landreaux, Kenny Lofton and Eric Davis, among others. The finalists competing in the Million Dollar Arm Pitching Contest will have the chance to throw three pitches on Hollywood Boulevard prior to the premiere screening and possibly walk away with the $1 million grand prize. The contest, a competition for amateur baseball pitchers from around the country presented by SUBWAY® Restaurants, began with preliminary rounds earlier this week at Walt Disney World® Resort in Florida, Disneyland®Resort in California and the Tribeca/ESPN Sports Day at the Tribeca Family Festival in New York City. Courtesy of Delta Airlines, the fastest contestants from each location will be flown in for the finals and any eligible finalist who throws one 100 mph strike will become a potential winner of the grand prize. Following the contest the finalists will attend the premiere screening as VIP guests and will receive a $500 gift package from Rawlings, a $250 gift certificate from Under Armour, two tickets each to the ESPY Awards and the winning pitcher – the one with the fastest speed – will get the opportunity to be discovered and sign a contract with JB Bernstein’s management company, Seven Figures Management. The contest’s finalists are James Brunswick, New York, N.Y.; Josh Dahl, Glendale, Ariz.; Collin Franklin, Kissimmee, Fla.; Elias Imbert, New York, N.Y.; Blaine Jones, Rancho Santa Margarita, Calif.; Brandon Otto, Kissimmee, Fla.; Harrison Russell Pyatt, Yorba Linda, Calif.; Steve Sirko, Danbury, Conn.; and Zackery Neal Watson, Gotha, Fla. In addition to presenting the contest, SUBWAY® Restaurants is also sponsoring the world premiere. Other participants include Krispy Kreme, Pinks Hot Dogs, Dole Squish’Ems, Coca-Cola, KIND bars and Wonderful Pistachios. Premiere guests will also have a chance to clock their own pitching speed, and the Los Angeles Dodgers’ renowned organist, Nancy Bea, will be providing entertainment as well. ESPN’s Baseball Tonight will also be broadcasting live from the premiere with host Karl Ravech, ESPN analyst and Baseball Hall of Famer Barry Larkin and ESPN MLB Insider Tim Kurkjian beginning at 10 p.m. ET. The hour-long program will include interviews with the film’s talent and filmmakers as well as other notable guests in attendance. Now in its 25th season, Baseball Tonight is ESPN’s signature Major League Baseball highlights, news and information studio show. The Baseball Tonight crew – Ravech, Larkin and ESPN analyst Curt Schilling – along with Sports Center anchor Steve Levy, have cameo appearances in the film. Baseball Tonight is available on computers, smartphones, tablets, Xbox, Amazon Fire TV, Apple TV and Roku via WatchESPN. 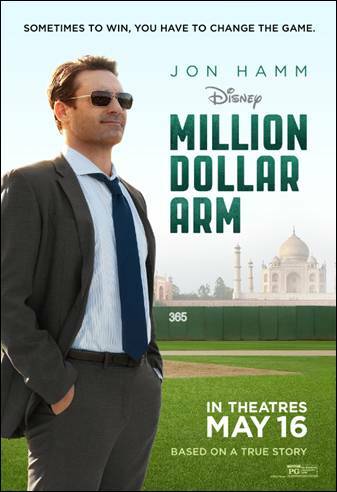 Disney’s Million Dollar Arm hits the theaters on May 16th.